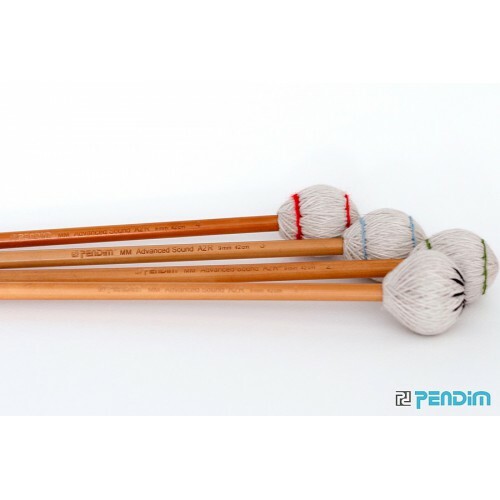 The Pendim "Advanced Sound" A2 (Absolute 2) is the beginning of new marimba mallets series. Series designed for musicians above the average level of sound extraction. The mallets are a combination of four medium A2 heads, wrapped differently in a way that makes every mallet independent. Mallet 1 is designed as a bass mallet with dual tone (better low frequences), Mallet 2,3 and 4 gradually became stronger and adapt into the mid-high range register of the marimba. "Advanced Sound" A2 can be described as solid, middle weight mallets with warm nuances. Absolute 2 - is the absolute middle between model 4 and model 2. it is not as heavy as model 4 and is not a light as model 2. It is very preferred by modern musicians.